Released in a 4-panel Digipak; includes a 12-page booklet. “Absinthe makes you crazy and criminal, it provokes epilepsy and tuberculosis, and has killed thousands of people”. Perhaps not surprising for a drink featuring an alcohol percentage often close to 100%! 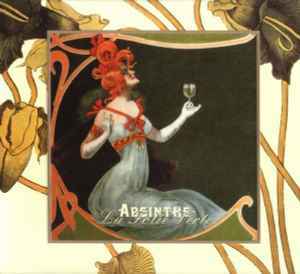 As a consequence Absinthe had been banned in the USA and many European countries by 1915, when many people drank the cheap green-tinted anise liqueur to defy their misfortunes and poverty. Described at the time by authorities as a dangerous psychoactive drug and hallucinogen, absinthe became fashionable again in the late 90s and as such the subject of this beautiful celebratory box set. Consisting of two 10 inch picture discs, a deluxe reprint of the 19th century book De La Liqueur d'Absinthe Et Des Ses Effets, several postcards and flyers as well as an original Absinthe spoon, to add sugar to make the undrinkable drinkable, ‘la folie verte’, or the green madness, is portrayed perfectly in both image as music. Master of the Absinth ceremony is Erik Konofal who, under his moniker Les Joyaux De La Princesse (The Jewels Of The Princess), employs industrial music, melancholic keyboards, ambient sounds and original speeches to create atmospheric soundtracks to French historical events of the 30s and 40s. Konofal’s releases are often extremely limited and feature elaborate packaging. His subject matter ranges from the 1937 Paris Art Exhibition, Philip Henriot, key figure of the French Vichy regime to the German White Rose resistance movement of the 40s. For Absinthe Konofal joined forces with Michael Moynihan and Annabel Lee of the neofolk project Blood Axis. Together they guide the listener through a haunted, delirious and delicious experience of the green madness, where degenerate behaviour takes over morality within a drink or two. It is not a surprise that all writing, recording and mixing of the album took place under the influence of absinthe. Even though the music is also available on CD, this deluxe box set remains the best way to consume Absinthe. Be it at your own peril!